With a plethora of environmental problems plaguing our planet, it has become imperative for everyone to be environmentally-conscious. This calls for leading an eco-friendly lifestyle. But such green living isn't possible unless eco-friendly utility items of daily use are available at affordable prices. So businesses also need to go green and fill this growing need for green products and services. Going green today is no longer a fashion, it has become a necessity. 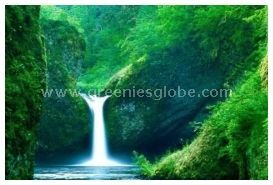 Greenie's Globe is a green website providing information on environmental issues and their solutions. It is a helpful guide for anyone willing to lead a green lifestyle as well as ecopreneurs intending to embark on green ventures. This site will endeavour to provide pragmatic suggestions for individuals to do their bit, and for organizations to do their biz - the green way ! Can we really do without Paper?